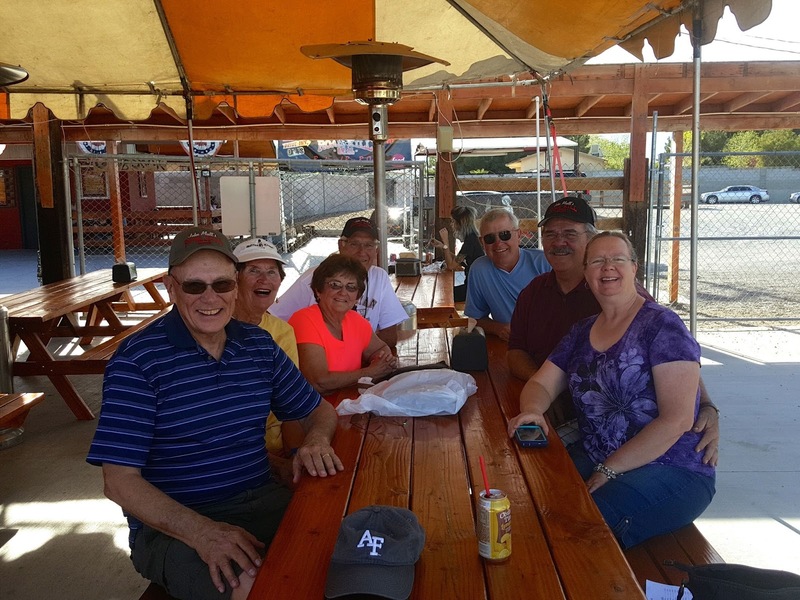 This is our last week in LV at Nellis AFB Desert Eagle RV Park. We are certainly going to miss our friends. It has been a good stay. Had the iHome washed this week. A very good service comes to the park and the cost is well worth having them. Only $2/ft plus $20 for the roof. Cleanest it has been since we left Oregon in October. John is going to wax it and finally replace the roof skylight. He is also replacing lights with LED strips that a fellow camper told him about. Thanks Ron for the info. 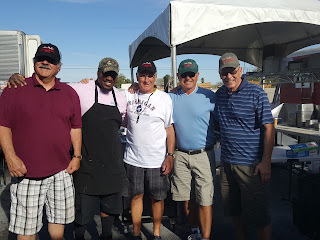 Several of us went to John Mull's Roadkill for late lunch.Always enjoy going there. They have a map on the wall with pin destinations of eaters. Since Donna and Larry are from Alaska, I think Cold Bay, the guys got free hats. They, also, had their picture taken with Larry who served us. A great lunch with fun conversation. After checking the weather going into Arizona, we decided due to high winds and rain over the weekend, to leave tomorrow instead of Saturday. Called the RV park in Kingman, Ft Beale, and asked if we could come in a day early and only stay 1 night instead of 2. They were very nice and accommodating. 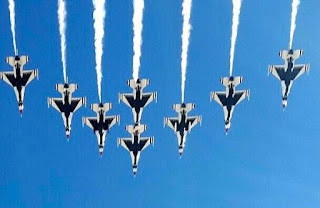 We want to be at Davis Monthan AFB in Tucson before Sunday. So John is getting the iHome ready to roll. 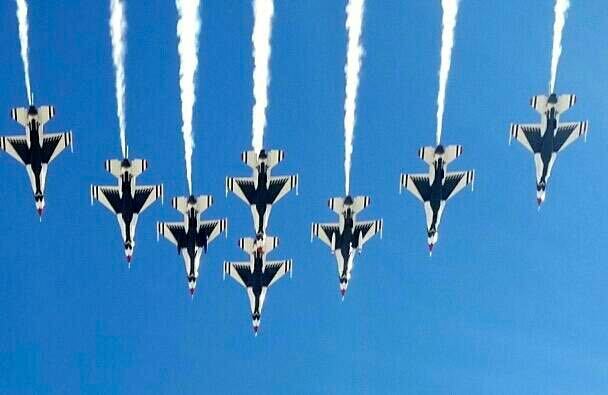 Donna got a very good picture of the Thunderbirds flyover returning home last October. This is a rare picture and one that I would love to get. Thank you Donna for sharing. 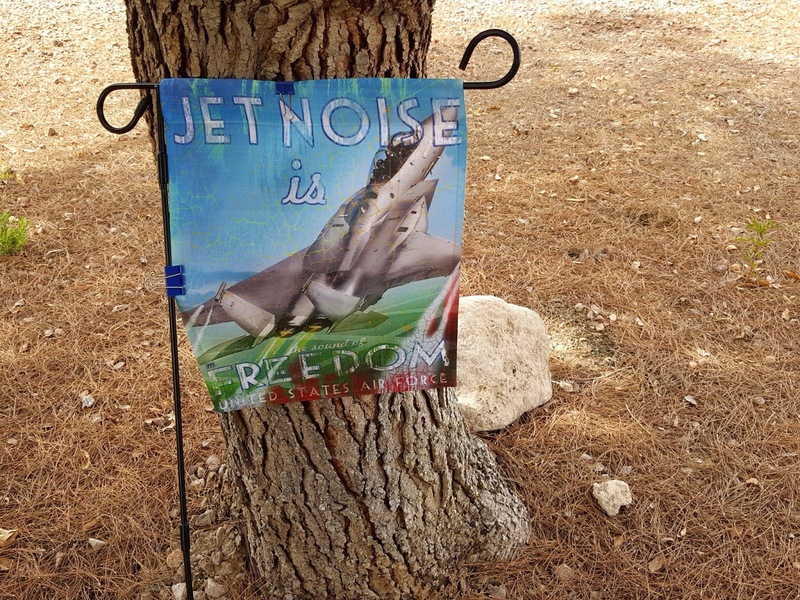 Also, while we were here, our neighbors had a yard flag that I liked and ordered one. 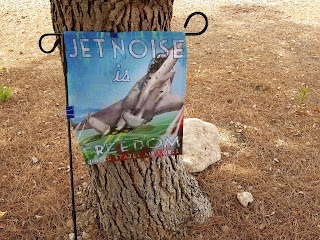 It says it all.."Freedom is the Sound of Jet Noise..USAF. 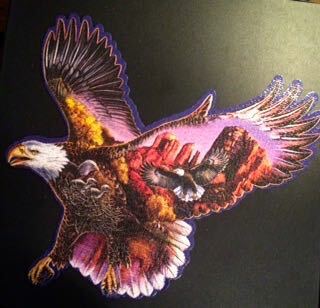 Chuck finished the 1,000 piece eagle puzzle. Couldn't believe it. He is good. He sent over a photo. Told him it was too easy and next time I would give him 2,000 piece puzzle..hee hee. When we left today, Judy brought us some homemade cornbread with side dish of beans..that is what is for supper tonight. Pat brought us her delicious famous potato salad for our lunch. Thank you dear friends and all who sent us on our way. You are the reason we keep returning.